Because variety is the spice of life, the West Philadelphia Orchestra Dance Party now comes in 4 irresistible flavors! 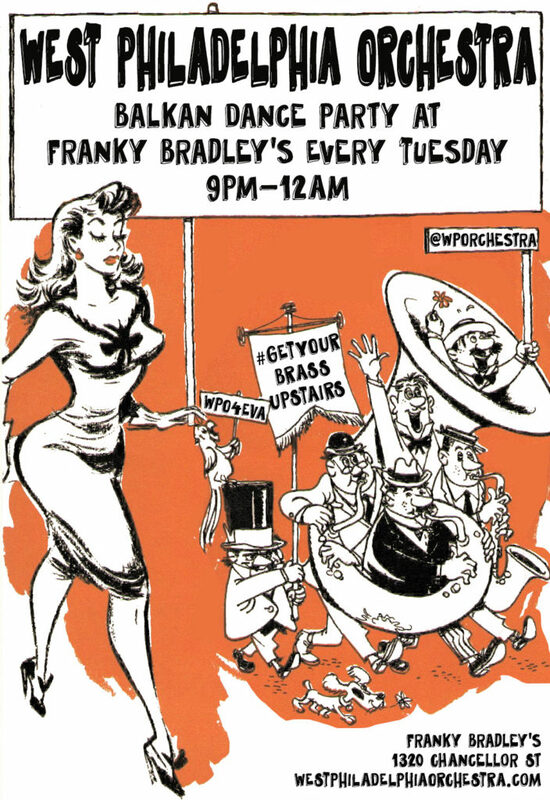 1st Tuesdays: “Classic BDP”– the Balkan Dance Party you know and love. 2nd Tuesdays: “WPO Electro” — think BDP, but with electric bass, synthesizers, and horns. 3rd Tuesdays: “Community Tuesday & BDP” — in which we all shake it for the benefit of a local non-profit. 4th Tuesdays: “WPO Eclectic”– Special projects from the WPOmniverse. The occasional 5th Tuesday: BDP – why not?! Click here to subscribe to our Patreon and get free and discount passes to WPO Franky Bradley’s shows! We are dedicating the 3rd Tuesday show each month in support of a Philly-based non-profit organization engaged in locally focused social action. $10-15 sliding scale cover and we split the proceeds with the featured organization. Next Community Tuesday, April 23, 2019. Featured organization: Neighborhood Bike Works!